What is ozone and how did it benefit the early Earth? Ozone (O3)—compared to the oxygen (O2) we breathe—usually refers to a blanket of gas found between 9 and 25 miles (15 and 40 kilometers) in the layer of Earth’s atmosphere called the stratosphere. The so-called “ozone layer” is produced by the interaction of the Sun’s radiation with certain air molecules. The blue-tinged ozone gas is also found in the lower atmosphere. While beneficial in the stratosphere, ozone forms photochemical smog at ground level. This smog is a secondary pollutant produced by the photochemical reactions of certain air pollutants, usually from industrial activities and cars. The stratosphere’s ozone layer is important to all life on the planet because it protects organisms from the Sun’s damaging ultraviolet radiation. Scientists believe that about two billion years ago, oxygen was being produced by shallow water marine plants. This sudden—geologically speaking—outpouring of oxygen helped to build up the ozone layer. As the oxygen levels increased, ocean animals began to evolve. Once the protective ozone layer was in place in the atmosphere, it allowed the marine plants and animals to spread onto land, safe from the Sun’s radiation. The formation of the ozone layer in the upper atmosphere early in Earth’s history created a radiation boundary that protects life on the planet. 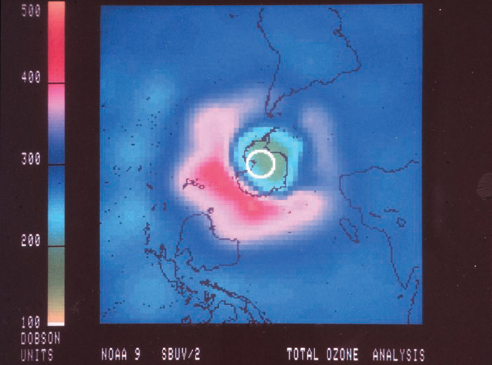 Today, scientists are concerned about the hole in the ozone that has appeared over the South Pole, as seen in this 1987 satellite image (National Oceanographic and Atmospheric Administration).